First taking flight in 1955 as a specially designed watch for pilots to keep track of dual time zones while on the job, the GMT-Master and GMT-Master II continues to soar in popularity over six decades later. On the occasion of the 50th anniversary of the Rolex GMT-Master, Rolex launched the redesigned GMT-Master II 116718LN in 2005 and it is still part of the brand’s current collection. Built from solid 18k yellow gold, the ref. 116718LN sports the anniversary green dial and a black bezel for a striking color combo. Among many of the new features that were unveiled on the 116718LN, the ceramic bezel insert took center stage. 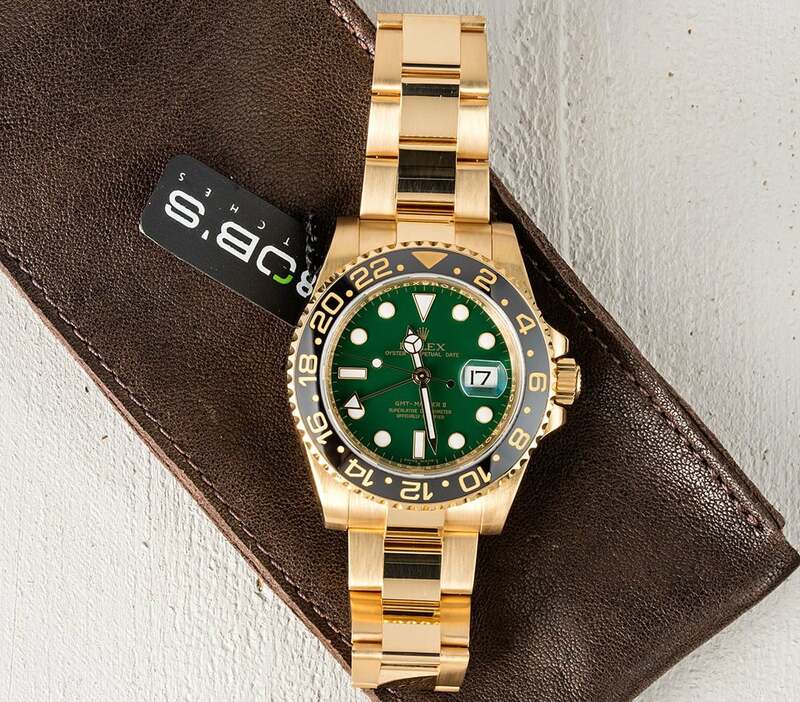 Labeled as “Cerachrom” by Rolex, the super resistant material is impervious to scratching and fading, thereby, upping the toughness factor of the popular Rolex sports watch. The bidirectional rotatable bezel is marked with 24-hours that, along with the central hour and minute hands and arrow tipped GMT-hand, allows the wearer to keep track of three separate time zones while exploring the globe. Also new to this GMT-Master II over its predecessors was what is known as the “Maxi dial”, in reference to the bigger lume plots, giving the watch a more modern and updated look. In the light, the large luminescent accented gold hour markers and gold hands contrast harmoniously with the signature Rolex green shade of the dial, while in the dark, they emit a blue glow that can last up to eight hours. Additionally, on the rehaut – the inner bezel ring – the Rolex name is repeatedly engraved as an anti-counterfeit measure. Although the GMT-Master II 116718LN retains its case size of 40mm, it actually wears bigger on the wrist thanks to its redesign. The shape of the Oyster case is squarer than before, while the lugs are wider, giving the timepiece a more masculine appeal and substantial presence. This particular restyling satisfies a concern that some had that the 40mm Rolex sports pieces weren’t keeping up with the current trend of bigger watches. Another enhancement found on the case is the Triplock triple waterproofness system on the screw-down crown replacing the previous Twinlock mechanism, safely ensuring water resistance to 330 feet. In the bid to make supremely comfortable luxury watches, Rolex is always looking to improve the small details. 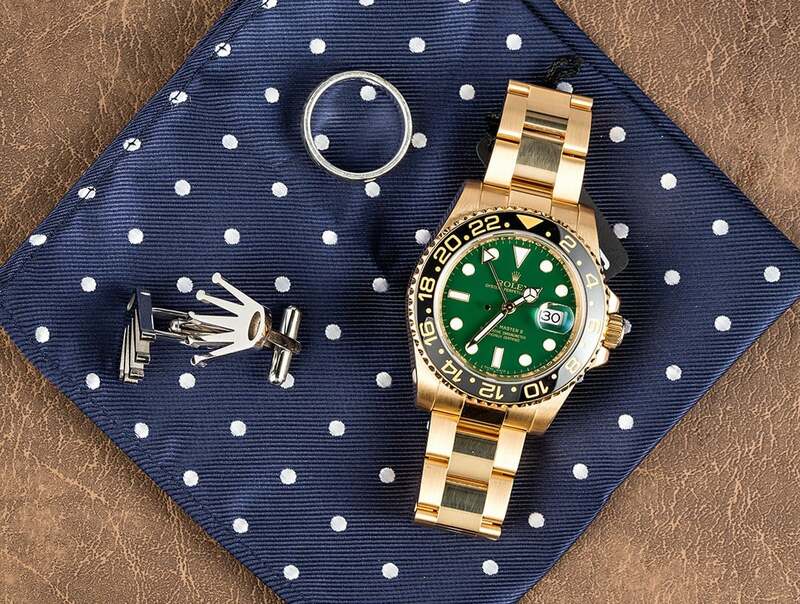 The GMT-Master II 116718LN boasts the enhanced Oyster bracelet with center polished links and the Rolex Easylink system, for not only an extremely attractive bracelet, but one that gives the wearer the option to lengthen the bracelet up to 5mm to find his ideal fit. A beautiful statement watch, the GMT-Master II 116718LN was an exceptional piece to pay tribute to half a century of existence of the iconic GMT-Master collection. And over a decade later, it still remains one of the most luxurious and alluring members of the Rolex family of professional watches.